Powerline networking is often overlooked in the networking world. Offering neither the security and speed of Ethernet nor the mobility of Wi-Fi, it instead is an in-between solution that users can turn to when other options simply won't work. A Powerline networking kit leverages the home's existing electrical wiring to establish a wired network that is accessible through every electrical outlet in the home. The ideal candidate for Powerline networking is a renter that can't run wires nor drill holes, or someone who lives in an area with lots of wireless interference. In those situations, a Powerline kit is worth a serious look. Powerline has its share of challenges—it's the second best option for a reason. It doesn't work great when the signal has to cross circuit breakers, which can negatively impact speeds. Also, you shouldn't plug a Powerline adapter into a surge strip as doing so blocks the data signal, and high load electrical equipment like refrigerators, vacuum cleaners, and microwave ovens can also negatively impact speeds. Given the overall benefits and drawbacks, the effectiveness of Powerline networking is highly subjective. It won't work for everyone, but it can offer a solution to some challenging networking problems where other methods, such as extenders, fall short. The Trendnet Powerline 1200 AV2 Adapter Kit has a lot to offer, including passthrough outlets, MIMO technology, Beamforming, and Gigabit ports to not bottleneck throughput speeds. The kit uses all three electrical wires to improve and stabilize coverage and throughput, which the manufacturer claims can provide coverage for up to a 5,000 sq ft home. Installation is very simple—just plug the adapters into their outlets and connect some Ethernet cables, as the adapters come ready to auto-connect right out of the box. They also come pre-encrypted with 128-bit AES, which proved to be rock stable throughout our testing process. We were particularly impressed by its strong download speed on the Same Circuit test, measuring 146.4 Mbps, which was only slightly behind the fastest adapter we tested, the D-Link DHP-P701AV, which hit 149.14 Mbps. Even more of an achievement is that while the D-Link kit dropped considerably on the Different Circuit test to 55.46 Mbps for the download and 33.03 Mbps upload, this Trendnet kit set the standard on this more difficult test, managing speeds of 96.33 Mbps down and 47.01 Mbps up. (For reference, our baseline Ethernet connection measured 207.96 Mbps down, 49.75 Mbps up.) Taking both of these tests into account, the Trendnet kit is the clear winner when it comes to speed. Additionally, its different circuit ping test was among the lowest at 11 ms, giving it a low latency for gaming. The TPL-421E2K clearly outperforms the competition, and with more than a thousand four star reviews on Amazon, it earns our recommendation. The street price of $59.99 for this kit sweetens the deal. Powerline networking is designed to provide a wired connection, but there are times when wireless is needed as well, such as connecting via a smartphone or tablet. For those occasions, a Powerline networking kit with Wi-Fi is a viable solution, functioning the same as their non-wireless brethren while also providing a Wi-Fi hotspot. Neither of the Wi-Fi Powerline kits we tested offered very good wireless performance. 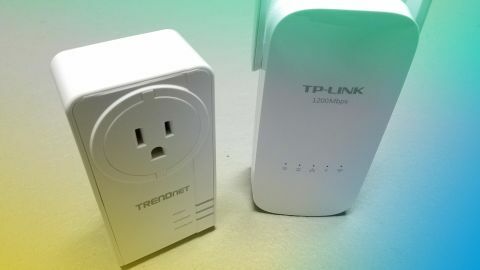 Same Circuit wireless tests were largely a wash, with this TP-Link kit edging out the competing Trendnet Wi-Fi Everywhere kit in most categories. On the Different Circuit, however, the Trendnet kit performed better, though again not by much. Regardless of the test, neither kit performed better than 39.64 Mbps wirelessly (that number coming from the Trendnet's 5 GHz Different Circuit download test), with most scores falling in the 15 to 30 Mbps range. Those numbers are fine for occasional web browsing, but not good for streaming 4K videos or gaming. 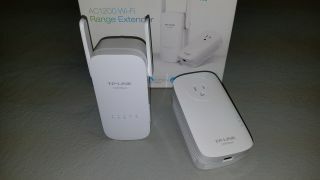 Having said that, we recommend the TP-Link AC1200 Wi-Fi Range Extender kit. While its Wi-Fi numbers aren't great, it dominated the competition on its regular Powerline connection, even beating out the dedicated Powerline pick above with a Same Circuit download speed of 186.31 Mbps. It also kept pace in the Different Circuit test, with 95.37 Mbps download, 39.67 Mbps upload, and a stable ping of 10 to 12 millisecs throughout testing. The TP-Link AC1200 uses a smartphone app for easy setup, and includes useful features like an electrical outlet passthrough on the adapter that connects to the modem, and an integrated three port Gigabit switch on the extender module that comes in handy, for example, if you need to connect networked AV equipment. For $114, we recommend the TP-Link AC1200 as it can provide a class leading wired connection and a usable wireless signal for less demanding tasks, simultaneously addressing multiple wireless problems. The D-Link Powerline AV2 2000 ticked all the right feature boxes, offering passthrough sockets and MIMO promising 2000 Mbps speeds. And while it performed very well on the same circuit tests, it produced lower throughput speeds and higher ping when moved to a different circuit. At $99.99, it's also more expensive. Trendnet's Wi-Fi Everywhere Powerline kit had lower throughput speeds on wired tests compared to our pick, although it did keep up in the wireless arena. We also didn't like the odd placement of the three Gigabit ports on the top of the adapter. Combined with the higher $119 price tag and a lower Amazon rating (3.5 stars) caused it to not earn our recommendation for this segment. Powerline networking adapters are usually sold as kits with two adapters. They can also be expanded with additional adapters, and a few different Powerline networks can be run simultaneously. Each adapter has at least a single Ethernet port, with some more recent kits featuring 10/100/1000 or Gigabit Ethernet. Some adapters also include additional Ethernet ports, letting it function as an integrated switch. This can be quite useful for media equipment that requires a wired internet connection. 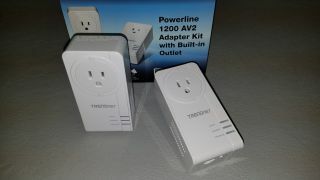 This Trendnet adapter allows access to the outlet above, and has a passthrough to the lower outlet as well. Another feature is how the adapter fits into the electrical outlet, in terms of blocking the other outlet. Some adapters feature a passthrough plug to allow use of the outlet while networking. Another feature to look for are additional Ethernet ports so there is an integrated mini switch. Powerline networking fits under the HomePlug specifications, the latest iteration of which is AV2. This standard requires Gigabit Ethernet ports, AES 128-bit encryption, and for adapters to act as repeaters. Current Powerline adapters are not the same technology as years ago, and this newer gear features MIMO (not to be confused with MU-MIMO which is a wireless standard). Powerline MIMO uses the ground wire in a three prong outlet to add an additional lane for data transfer. In addition, they utilize Beamforming, which is a technology to increase the throughput between adapters of each data stream. A variation of the standard kit is the Powerline Wireless Extender kit. This also has two adapters, with the first a standard Powerline adapter, and the second is also a Powerline adapter, but also has a wireless access point integrated into it. For wireless dead spots these kits can be a viable option, although the lower wireless speeds would not want us to make them our only option for Wi-Fi access. Best results are in bold, and Ethernet wired tests are provided as a baseline for comparison. We ran a series of tests to identify the better gear in this segment of the networking arena, and we also ran the same tests directly wired via an Ethernet connection to the router for baseline measurements. Via the Speedtest app in Windows 10, we measured download and upload speeds, as well as the ping, and did this on both the same circuit as the router, and in the more challenging situation of a different circuit as the data has to traverse circuit breaker. We also focused on the latency to a gaming server via Powerline networking, and we quantitated this via Pingplotter software, and measuring the latency to a World of Tanks server (162.216.229.21) across 50 serial measurements and report the average. Powerline adapters continue to evolve, and the latest feature to be added is a PoE on a recently announced Trendnet kit, to facilitate adding security cameras, without the need for an additional electrical connection.